Well, I’ve been hunched over the computer labelling posts with the new blogger labelling thing. Because I like to categorize. But it’s not as organized as I would’ve liked. Ah well. What do you think of the new template? A little too pink? More pleasing to the eye? Go back to the simpler one? Comments, if you will. Or not. Here’s a photo from my reading on Thursday. I look a little demonic, but I guess that’s me getting *really* into character. Last night was joyfulicious. 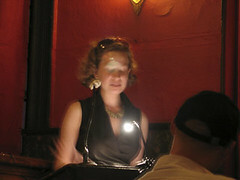 My first reading, really (if you don’t count “coffee house night” in my dorm, freshman year of college, dressed in black reading poetry I’d written in high school…heh). I went last, after Matt Cav and Professor Arturo, both wonderful readers and writers, both so different from each other and from me (hooray for variety!). The podium successfully hid my shaking legs, which stopped trembling somewhere around page 5 of 9. I really enjoyed performing. It’s one thing to sit alone and write (also, a joy; also, torture– but we love pain, don’t we?). It’s another to get to share your work with a responsive crowd and really get into the voices of your characters as you’ve envisioned them, get into the rhythm and intonation, take the appropriate pauses, make eye contact with and funny faces at perfect strangers. I’m looking forward to reading again. I’ve created a mailing list for future readings and publications. If you’d like to join, just enter your email address in the sidebar. I promise not to flood your mailbox. 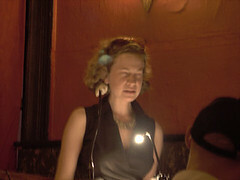 I’m reading a short story at KGB tonight–it’s called “Skitter” and its going to appear in The Massachusetts Review. Also performing are Matt Cav, Kidd Lambert, and Professor Arturo. trying not to fall over and praying my voice doesn’t squeak. I’ll also be sweating profusely. In case you’re having trouble getting your hands on the current issue of Antigonish Review, selections including my own story are now up on their website. If you like what you see you should still support them though. I’ll be reading one of my short stories at the venerable KGB Bar, Thursday, August 17 (that’s a week from tomorrow!). The reading is from 7-9 pm.